Laying Flat: Height - 3 1/4 in. Width - 4 1/2 in. For those dog lovers in your life! This cup cozy set would make perfect gifts. You can also sell your finished cozies as a fundraiser to create awareness for your local dog shelter and donate part of the funds to your shelter. Some knowledge of Tapestry crochet is recommended. This would be a nice project though for someone who has never worked with the tapestry technique. 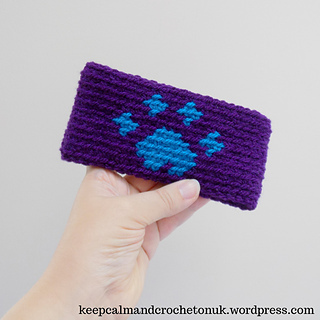 The pattern includes written instructions as well as a graph of the bone and paw print. Yarn I suggest for this is a worsted weight cotton yarn. It is important that you read through all of the pattern notes before beginning to familiarize yourself with any techniques etc. Intermediate difficulty.